We should’ve figured that going to Capitol Hill to talk about the connections between free trade agreements (FTA) and migration in Latin America wouldn’t go over well with our congressional representatives. Happy Thanksgiving, however you may celebrate it. So we have one piece of good news for the day, Jonathan and Isaac were released very early in the morning today. They spent a total of 10 days in the Basile immigration detention center, the first five days they were in a New Orleans prison. The action they took part in was an intentional action to get involved with immigration authorities. We know many of you think it’s crazy but why not? Immigration thinks it has some power over our communities, they think they can hold us hostage with the threat of detention. So why not take the power away from them and let them know we can go to detention on our own terms. If we take the fear card away from them then what do they have to hold over us? What would it look like the next time a bill like HB56 were proposed and the community was actually willing to stand up to the racist legislators? That is a future we want to see. We eliminate the fear. We empower the community to stand up for themselves. We then demand change, our own change. If you organize you are safe. Reporting from Mexico City— North of the U.S.-Mexico border, Republican presidential candidates are talking tough on illegal immigration, with one proposing — perhaps in jest — an electrified fence to deter migrants. We are undocumented, unafraid and now undercover. For a while we organized the traditional way thinking things would change. Then we realized we had push a little harder, so we started escalating and demanding change. President Obama was onto us, he came out with a big announcement to get support from the Latino community. We knew it was a lie and many of you knew it was a lie but others fell for the trap. You know the NCLR, CHIRLA, Reform Immigration for America crowds . . . This week we set out to show it was a lie by intentionally getting undocumented youth into a detention center. After all, if Obama was true to his word we wouldn't be successful, right? Meet Isaac Barrera and Jonathan Perez, youth from California. You actually know both of them, they were participants in a San Bernardino civil disobedience action. This past Thursday both of them walked into a Mobile, Alabama Border Patrol office protesting against HB56. Both were detained and, within hours, transferred to the Basile immigration detention center in Southern Louisiana. Isaac and Jonathan are now doing what they do best, organizing from within the detention center where they are gathering stories of others detained, those not connected to a larger network. 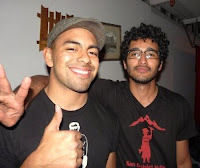 Take action and support the work of Isaac and Jonathan from within the detention center. Think we can have them home by Thanksgiving? Immigration thinks it can go after us, well we have news for them, we can go after them too. We can enter their detention centers on our own terms and, with your support, we can come out. Let's bring Jonathan and Isaac home for Thanksgiving! In less than 48 hours, we may lose a modern day hero. Francisco “Pancho” Ramos-Stierle was arrested on Monday as he was sitting in silent, non-violent protest against the deep inequality that pervades our society and affects so many Latinos and immigrants. But what makes Pancho different from so many of the "Occupy" protestors who have been arrested is that Immigration and Customs Enforcement (ICE) is trying to deport him. Pancho's information was immediately passed from local police to immigration officials through the Secure Communities (S-COMM) program. So even though the charges against him were dropped, he is still under federal immigration hold. ICE has less than 48 hours to either take him into federal custody or release him and cancel his deportation. He was bravely standing up for his community, and now we have to stand up for him. Can you take a moment and sign this petition demanding that ICE release Pancho and cancel his deportation immediately? And can you forward this email to your friends and family then post to your Facebook and Twitter profiles? Pancho was arrested during an early morning raid on the Occupy Oakland encampment on November 14th.1 He participated in Occupy Oakland because he was tired of banks and corporations dominating our country's politics. Our communities have suffered disproportionately as corporations and the wealthiest among us gain more and more power. Latinos across immigration statuses have lost a staggering two-thirds of our wealth in the recession.2 And for the first time in U.S. history, more Latino children are living in poverty than children of any other ethnic group, and more than two-thirds of them have immigrant parents.3 Meanwhile, coorporation such as CCA and GEO are making billions and profiteering by jailing immigrants like Pancho. Before his arrest, Pancho was pursuing a Ph.D. in astrophysics at UC Berkeley but resigned from the program when he learned that his work would be used to promote “safer nuclear weapons.” His service to community took many forms – whether promoting community gardens or workingfor migrant rights in Arizona. Although local courts dropped the charges against Pancho, his fingerprints were immediately forwarded to ICE as soon as he was in custody. This direct pipeline to ICE and deportation is the hallmark of the Obama administration's S-COMM program - a flawed program that fosters racial profiling against Latinos and authorizes local police to act as immigration officers. Now, we must fight to get Pancho's deportation cancelled. Click here to sign the petition. Some immigration advocates are celebrating the ouster last night of Arizona Sen. Russell Pearce, author of the state's controversial immigration law. Some African-Americans in Alabama see HB 56 as "a giant step backwards"
Illinois Congressman Luis Gutiérrez (D) has always said that the fight for immigration reform is a civil-rights issue for the immigrant community in the United States. If there's one experience that Mexicans have in common more than any other, more even than hatred and repudiation of the mutual violence of the narcos and the government, it's migration. In Oaxaca, 18 percent of its 3.7 million people have left for other parts of Mexico, and especially for the United States. Almost half its towns have shrunk, and migration has become part of the daily experience for almost every family. ALBERTVILLE — At least a half-dozen poultry plants shut down or scaled back operations Wednesday and many other businesses closed as Hispanics in Alabama skipped work to protest the state's toughest-in-the-nation immigration law.